The new version is a scalable universal app that catches up on features compared to Twitter apps for other platforms. A few days ago a new version of the Twitter app appeared in the Windows Store but wasn’t available for download. 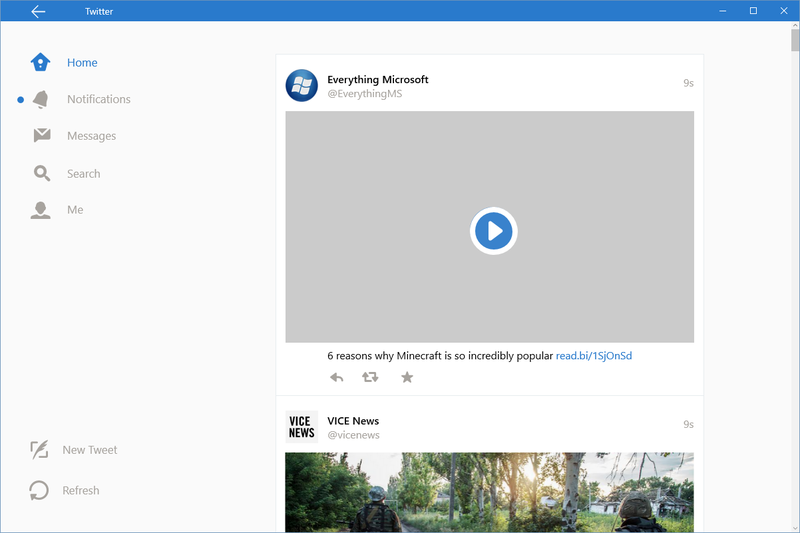 Then alongside the Windows 10 debut on Wednesday, Twitter rolled out the new Windows look exclusively for Windows 10 users. The new app update is the first significant change to Twitter’s Store app since it first debuted in March 2013. The original version of the app, when you got right down to it, was pretty bad. It barely did anything beyond the basics of creating tweets, retweeting, and viewing your timeline. It didn’t even update the timeline on a regular basis, requiring manual refreshes much of the time. 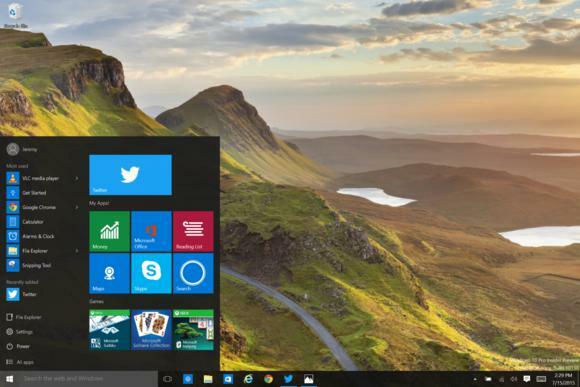 When Microsoft added new features to Windows 8.1 like Snap, which let a modern UI app and the desktop split the same screen, Twitter's app did little to take advantage of that. In fact, the app was even worse when snapped: It shrank to the dimensions of a smartphone app, with an unbelievable amount of wasted space. But let’s not dwell on the past. Twitter’s new app is an excellent update that is well worth using. Most importantly, the app is current with Twitter’s capabilities elsewhere. You can view animated GIFs, play back Vine videos, and tweets with media content display a preview in your timeline, just like you’d expect. You can also share photos in direct messages and upload up to four photos per tweet. Twitter says the new app also uses Windows 10’s Live Tiles feature, but I honestly can’t recall if the older app did so as well. 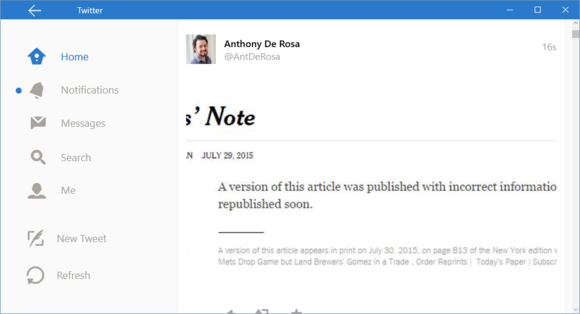 Why this matters: Twitter is only one app, but it’s great to see any name-brand Windows app get a fresh coat of paint and improved functionality. The new app also takes advantage of Microsoft’s universal framework, meaning it can scale up to a large desktop display and down to a small handheld device. Perhaps Twitter’s revitalized app is a preview of what’s to come from major app makers who embrace the Windows ecosystem. Then again, this could just be part of Twitter's efforts to revitalize its user growth by reaching out on more platforms. Twitter for Windows 10 shrinking down nicely for Quadrants. 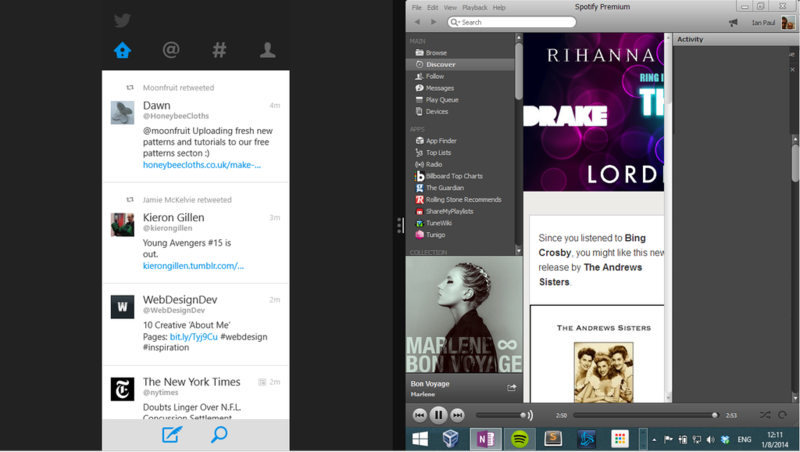 Twitter for Windows is truly a good-looking app, arguably for the first time. The app adjusts beautifully when you snap it to the side of your screen or use it Quadrants-style, taking up just one quarter of a display. The app still has a lot of blank space, but that may be unavoidable given the core simplicity of Twitter. While Twitter for Windows 10 is nice, it could use a little work. The app can’t open links in situ, for example, throwing you out to the browser instead. That includes not only displaying third-party webpages, but even linked Tweets.